My father always said one should write right away. When the impressions are fresh, when it still hurts, and when it’s still with you. There is much that I haven’t written down. Even for myself, even when I had the strength. For example, I did not write about accidents. It would seem they are trivial. But I didn’t write because of my mother. We carefully tried to conceal from her what happened. There were hints, there were euphemisms, but never a direct description. We had three cars on our third trip. A rented truck, and a BMW. It was Oksana’s, Sasha’s girl, with whom we went on the very first trip in ’14. She also wanted to go so we took her car, since we would not all have squeezed into the truck. We were passing Efremov, it was night, there was ice on the side of the road, and we drove fast. I sat behind the wheel, everyone else slept. I don’t know if it would have made any difference if Sasha or Oksana were awake. But I doubt it. The car was whipped about, and I still have dreams of the car being carried along at enormous speed and you can’t do anything about it anymore. The car fell into such a spin that it managed to bounce off road posts on both sides of the road. Nearly every car that drove by stopped. There was frost, and I remember one attractive pair which gave me tea in their car while we waited for the road police. I was crying, and the girl hugged me. Then we got acquainted with Sasha the Road Commissar who then found me on Vkontakte social media and began, together with his friends, participate in aid effort by sending quite a lot of food for the Donbass. His wife died in a crash a year later, not far from the site of our accident. She rode in a taxi, there was an 18-wheeler next to them, and the driver fell asleep. I’ve mentioned this crash many times in the context of the death of Zhenya Ishchenko, a hero of Novorossiya, the mayor of besieged Pervomaysk, he was killed on that very same day. I decided not to drive after the accident. We had a different composition on our fourth trip. We also rented a car, Mercedes-Sprinter. It was a horrifying trip. On the way, already in LPR, the Mercedes caught an iron spike in the wheel, but we only noticed when we were in Lugansk. It was a miracle we made it, and we didn’t even know it. That was a terrible night. I got into a car that accompanied us. There was curfew, one could not drive after 11pm without a pass. So I sat in Rostislav’s car when he saw Grad volleys outside. His face did not move a muscle, but his girl in the front seat lost it. She started to wave shake her arms and head, cry, and hit the seat and the window. Perhaps her fit brought me back to reality and prevented me from succumbing to my own fears, because I was ready to start butting my head against the window. I could not tear my head away from the glass. It was such fear that defied description. I was sure they were shooting at us. I wanted to jump out and into a ditch. But you know what? I’ve never seen such a beautiful and clear sky as I did that night. Not before, not after, not in the mountains of Tyan-Shan, Caucasus, Khibiny, or Crimea. Nowhere. That’s what made it doubly terrifying. Sometimes I dream about fiery salvoes in the midst of the beauty of the Cosmos, which fly out at tremendous speed and land all around us and I don’t know what to do with myself. Those nights I scream, and wake up only after I jumped out of bed, breathing heavily. So this was a difficult trip, but by and large according to plan. We were going back, already made it to Russia, and were near Zadonsk. Ruben was driving, Zhenya and I were scrunched up on the rear seat and the car began to slide. I woke up from the shaking and was not buckled up, but Zhenya managed to squeeze me onto the floor so that I only hit my head lightly. I screamed like a wounded beast. It’s been only three weeks since the last crash so when the car got out of control I once again saw that bridge before Efremovo when I drove and we crashed. I screamed from the shock, embarrassment, anger, own stupidity, and naked fear that we won’t be lucky the second time. The car was passing a gas station, by some miracle hit a post and turned around, otherwise we’d not have been among the living. There was a ramp and a cafe and other weird shops, we flew across the shoulder and got whipped around. Zhenya later gave me a long technical explanation that we were saved by over-inflated tires, the post, and many other things. I can’t explain it. I remember the car being crumpled and us being alive. I also remember that the highway patrol showed up only two hours later. In the meantime it snowed and all our tracks were covered. The patrol showed up and at first refused to file paperwork on our accident because we did it on purpose in order to collect insurance. Zhenya talked to them, walked with them a long time, showed them our trajectory, pointed here and there, told them something. I was blue from the cold and cried without respite. Then Zhenya waved to me to come. I come up, and he asked me to show the photos from the trip. So I showed them Pervomaysk, Lugansk. Burned out tanks and IFVs. Kids in bomb shelters. They looked on in silence. My hands were shaking and I was crying. The patrol filed the paperwork in such a way that the insurance paid for everything. We returned to Moscow on a tow truck. Then I got ill. For three weeks. Heavy fits of coughing suffocated me. We concealed the accident from mom, and a month later went again. I don’t know why. I had this maniacal idea. After seeing the kids in bomb shelters, old ladies who were not outside for six months, I could not but go again. I would have gone mad otherwise. It became my obsession. And yes, I became deathly afraid of cars. On the fifth trip we were with Anton and Zhenya. I lost my mind every time the car shifted gears. What can one say, that lasted for a long time. 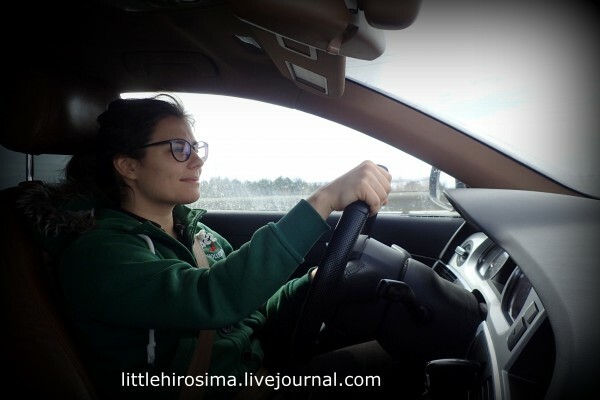 I was terrified of driving, but forced myself. When I fell asleep, I woke up at the slightest jolt. I would jump up and start screaming. During the summer, we went with Zhenya’s Audi, and he forced me to drive. I drove about 80km, then my nerves gave in to fear. My hands were shaking every time the car changed gear, passed a tractor, or a dead bird on the road. When 18-wheelers went by, I yelled at Zhenya in panic to have him hold the wheel. I didn’t want to drive, I was afraid to drive, but Zhenya made me. He said I must, otherwise I never again will. So I forced myself. You know that sensation when you sit behind the wheel and are driving, forgetting about everything, the road is fine, you start enjoying it, and then you suddenly feel the car is driving and you are done for. I see that bridge near Efremov, the gas station near Zadonsk. This March we went to the Donbass for the 20th time. On the way back I drove 400km without stopping. And then I realized I was no longer afraid. I could drive alone, without hysteria, fear, terror. But I still don’t understand what propelled me back then, in 2014-15, when even after two terrible wrecks which we survived only by miracle I kept on going back. Father said that one has to write at once. And I regret I did not write anything then about what happened. Even if only for myself. Perhaps I would have been able to find answers. And when they asked me now why I kept on driving and keep on driving there, why I continue humanitarian aid, I can only reply–I don’t know. This entry was posted in in English and tagged donbass, Kolbasa's mom, road, war, war sketches by Михаил Ясинский. Bookmark the permalink.